Peter Coffee (@PeterCoffee) is a repeat guest on the TechnologyFlows podcast. With a seemingly bottomless bag of statistics, quotes, anecdotes, and historical references to back up his opinions it always makes for a fascinating discussion. This conversation was recorded live in front of an audience at Dreamforce 2017 in San Francisco. Peter’s energy and enthusiasm were in full effect even as we were setting up the podcast recorder! It’s just one week since I returned from Surf Force, a highly enjoyable community-led Salesforce conference held this year in County Donegal, Ireland. Surf Force 2017 was a unique opportunity to discuss technology, social and environmental issues in a family-friendly environment with leading thinkers from the Salesforce ecosystem. Attendees were treated to 2+ days of presentations, conversations, new horizons and of course, surfing. I will be going again next year for certain. The location on the west coast of Ireland was remote and required a travel commitment beyond a “capital city” conference. We flew into Dublin and then drove across country for a few hours. The town of Bundoran is a magnet for surfers visiting the Wild Atlantic Way and the conference was located in the Great Northern Hotel on a headland overlooking the dramatic ocean. For me, the location in the landscape created the feel of a secluded retreat that allowed me to put aside day-to-day concerns and focus on the here and now. Smaller conferences provide a unique opportunity to speak with leading members of the Salesforce community and Salesforce employees who are technical experts and leaders. I joined my wife Jess, who also now works in the Salesforce ecosystem and the timing of the conference provided an opportunity to bring along our girls, ages 3 & 10, to experience the environment and people. Other attendees too brought their partners along for the trip and there was an adorable 7-month-old baby who became the conference darling! Surf Force attracted a list of Salesforce names over from San Francisco; Chuck Mortimore, SVP of Identity & Security Product Management, Gregg Rewis, Principal Developer Evangelist and Charlie Issacs, CTO for Customer Connection (a.k.a IoT). It was also wonderful to catch up with Community Director Holly Firestone, who was introducing a new recruit in her team, Tiffany Oda to the community at large. The EMEA team of Christe Fidura and Will Coleman were on hand supporting the organisers in delivering and recording the conference. This level of attendance demonstrates how important these grassroots conferences are to Salesforce’s event mix. Attendees and speakers came from near and far and I saw presentations from Lauren Touyet, Chuck Liddell, Roger Mitchell, Meighan Brodkey, Barry Hughes, Penny Townsend, Sean Dukes, Paul Harris and Martin Humpolec. The content was more diverse than a corporate event such as you would find at a Salesforce World Tour or Dreamforce. This is a big plus for me to see out-of-band topics from people who are passionate or expert. Having the time and space to chat with them during the event was hugely valuable to me and opened my mind to new ideas and points of view. The keynotes and panel discussion were equally thought-provoking and I was so happy that my 10-year-old daughter was sitting next to me and had the opportunity to see Ann O’Dea, CEO and Co-Founder of the technology website Silicon Republic, talk about how women have been instrumental in the development of computing & technology through history. Ann listed multiple role models, beginning with Ada Lovelace, Grace Hopper, through Katherine Johnson, Dorothy Vaughan, and Mary Jackson (NASA’s Hidden Figures) and up to the modern day. In the second half of her presentation, Ann expanded the theme from WIT to diversity and inclusion for all abilities, languages and races. Her conclusion was that it feels as if attitudes have come a long way but that we should all lend our weight to keep the momentum needed to close the gaps. By way of example, Ann introduced an event called InspireFest, which she is involved with to create a positive environment for young people who will shape the world of tomorrow. I have put this event on my calendar for next year. I want to congratulate the Surf Force leadership for including environmental issues in the event programme. The presentation from Clean Coasts officer Beckey-Finn Britton on ocean pollution, was really shocking to me. Clean Coasts is a charity that organises beach cleanups around the coast of Ireland in response to the global problem of rubbish in the ocean. Beckey explained to the Surf Force audience that almost all the rubbish which washes up on beaches is some kind of plastic and the items which Clean Coasts volunteers collect and catalogue is an indicator of the volume of plastics which continue to grow in the World’s oceans. The surfing activity group was made up of novices and experienced surfers (those folks from California!) and it was operated by a local surf school who provided the gear, supervision and coaching. Before we took to the water the group carried out a beach clean. The volume of plastics and general rubbish which we collected in a 20-30 minute period blew me away. Beckey’s presentation the day before had shown pictures and graphs but here in front of me was the ugly reality of the problem piled up amidst the beauty of the beach and sea from where it came. The water and waves of Tullan Strand where we surfed were simply beautiful. While the experienced surfers paddled out to sit on their boards’ commune with the power of the ocean, we novices stayed waist deep and caught white water waves. The power of the waves was still plenty to launch boards towards the beach and after a couple of turns jumping on and riding the waves laying down I decided to give standing up a go. Though we had practised the technique on the beach to “pop” from laying to standing I didn’t have much luck and will need some more practice in the future. No such problem for the young though – I was treated to the sight of my 10-year-old daughter catching her first waves and successfully standing up within minutes. Oh to be young again! Thanks to all the sponsors and to the passion and energy of Shaun, Kerry, Scott, Marcelle, Lauren and Mick for bringing Surf Force 2017 to the world. Once you have all recovered, I hope that you will start to plan for 2018. You can be sure that I will be there, and maybe I’ll bring my two sons along next time too! In this episode I will be speaking with Doug Ayers (@DouglasCAyers) about his approach to interpreting requirements and evaluating the options to architect a solution. 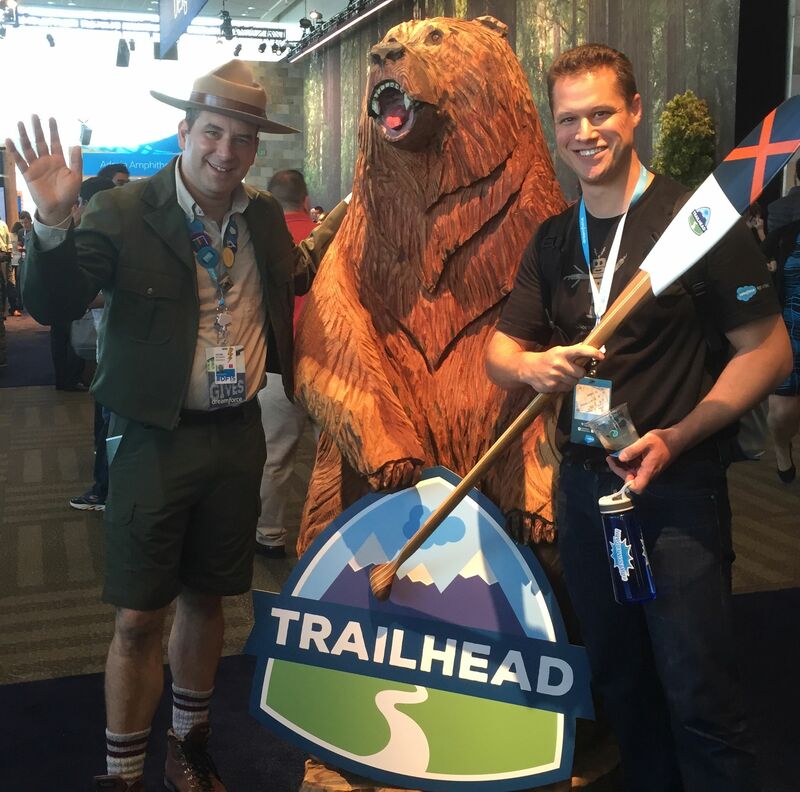 As an experienced web application developer coming to the Salesforce platform more than 5 years ago, Doug already had extensive technical skills which he could to use to grasp Apex and Visualforce, but how did he adapt to working on a platform? I asked Doug about his own experiences and the lessons which he now teaches to fellow developers. We discuss the value of asking more questions to uncover the depths of requirements and how the significance of considering the way a solution will be maintained over its lifetime is as important as how easily it can be created. 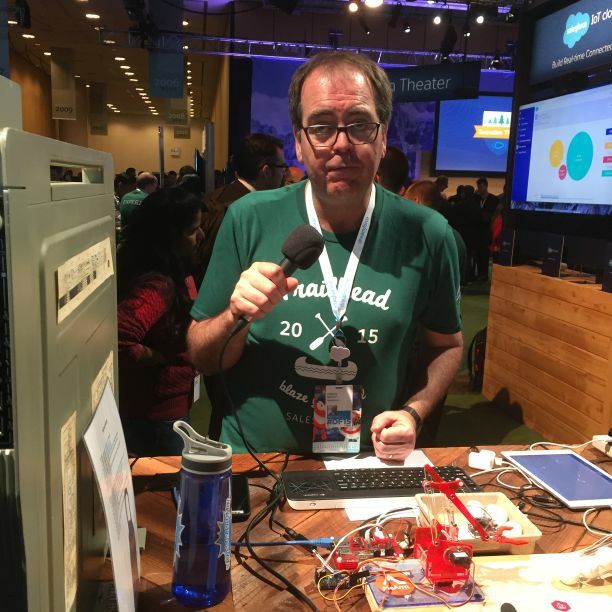 Doug’s a problem solver, as can be seen from his GitHub repository which hosts multiple utilities he has created to fill gaps in Salesforce functionality. For example when Doug saw a question on Twitter asking how to migrate Salesforce notes & attachments data into the new Notes feature, he did some research and found that the feature wasn’t available out of the box. So he wrote it himself! He did the same for migrating file attachments to Chatter files, he created an automation Bot for Chatter groups, enhanced Campaign member management, the list goes on. You can read for yourself on Doug’s blog at douglascayers.com. You can find Doug on Twitter @DouglasCAyers. In this episode I will be speaking with Daniel Peter (@danieljpeter) about processing large volumes of data on Salesforce. Daniel is Lead Application Developer at Kenandy, an ISV who had built an ERP solution on the Salesforce Platform. Daniel’s first hand experience of how the Salesforce multi-tenant database behaves has lead him to develop techniques for processing tens of millions of records. Daniel will explain how the Batch Apex query locator can be used to implement a technique called PK chunking which allows fine-grained control of the number of rows to be processed in each batch which largely overcomes the 3 common exceptions. Daniel has even gone as far as experimenting with parallel execution through his Hyperbatch open source project which you can download from GitHub. An explanation and demo can be seen on YouTube. Whether your Salesforce database contains tens of thousands or rows or or if you’re up into the 10 of millions Daniel’s tips on working with multi-tenancy are a real eye opener as to what is possible when you design for scale from the outset. In this series of interviews I will be speaking with people on the frontline of Salesforce architecture & development. In this first episode of the Architect Series my guest is Francis Pindar which is very fitting as he was one of the pioneers of the UK Salesforce Community scene and one of the first people that I came into contact with when I got involved with Salesforce back in 2010. Since then he’s continues to be a source of ideas and wisdom to me and countless others. Salesforce Certified Sales Consultant, Service Consultant, Developer, Administrator & Advanced Administrator. Francis has worked in internet technologies for 20 years, the last 10 of which have been on the Salesforce Platform. He is a specialist in the areas of Enterprise Architecture Design, Business Process Improvement, Project Leadership, Business Analysis & Migration strategies. On the 8th May 2017 I attended the Salesforce Certified Technical Architect Review Board examination at Salesforce Tower in London. It lived up to it’s fearsome reputation and was an educational experience in itself. I had been preparing myself for all possible outcomes since walking out of the final session of the exam with my head spinning and questioning whether I was even fit to tie my own shoelaces. Talking with CTAs I met in the weeks that followed confirmed that many people feel the same way, so I had no clue as to what my result would be. So I just had to wait. Three weeks later the early morning email from certification@salesforce.com arrived. There was a brief moment of excitement as I waited for the message to load. Then “We regret to inform you…unsuccessful, Result: FAIL“. I was disappointed of course, and then all the other emotions took their turn as I read through the detailed feedback included in the email. I made notes as I went, thinking back to questions the judges had asked me, assumptions and choices which I’d made in my design. I kicked myself for the easy things which I’d omitted from my presentation and got confirmation that I’d made a couple of fundamental mistakes with respect to security and large data volumes which sealed my fate. This confirmed that my preparation had been worth the effort but that I had not mastered all the knowledge areas. Everyone I met did their best to make me comfortable and ensure that I had all the things that I needed during the 5 or so hours that the review process takes. But it wasn’t possible for me to be relaxed of course. I stuck to my plan for the 2 hours given to read the scenario and prepare the solution. I found it challenging to extract every requirement from the 6 dense pages, but went line by line piecing together my ideas on A4 note paper as I went. With 30 minutes remaining I transferred my draft sketches to the large flip-chart pages with markers. There were still some gaps in my thinking (bad sign, see lessons below) but I was running out of time. So I added some final details and validated my choices as best as I could. Time up and I had 15 minutes to refresh and collect my thoughts for the presentation while the judges took a first look at the pages as they were taped to the presentation room wall. For the presentation stage I treated the introduction as I would for real clients. I started with a welcome and stated the purpose. I went on to summarise the pain points that Company X had and the business objectives they were looking to meet using the new Salesforce solution. I then moved to use the diagrams and introduce the systems, the actors and the key aspects of Salesforce which would be implemented (I was not comprehensive, see lessons below). I was then ready to detail the solution and my recommendations. I went line by line from the scenario and for each requirement described the Salesforce features or customisations which would be used, I made use of the diagrams as to illustrate to the judges the relevant details . With time running short I was going faster and faster in order to cover the full list of requirements. Time up, and a short break for me while the judges compared notes and prepared their questions. I was then invited back into the presentation room for the 40 minute Q&A section. I enjoy debating solution options with clients and colleagues in the real world, but here the judges are permitted to only ask questions so that the candidate is restricted to their own knowledge and experience. The majority of questions I was comfortable with but I also had a few instances of “erms…” and missteps where I got half way through my answer and then revised it. It’s clear to me now that these were my weak knowledge areas and, true to form, the judges sniffed them out. After reviewing the feedback I have identified the knowledge areas that I need to strengthen. Under pressure in the exam I didn’t have immediate recall of some features that were important to my solution because I had not practiced them enough in real-life or during revision. For example, I didn’t remember that a registration handler Apex class is needed to set up users signing on via Facebook. I will use more hands on study to reinforce my knowledge in the areas identified. I have also reviewed the way that I approached preparing and delivering the presentation for the judges. Whilst my first attempt followed the plan that I had, the experience has given me 3 key lessons which I think will help me in the future. I feel that this was my biggest preparation shortcoming. There is only enough time to go through the scenario pages one time, so when a requirement is identified it’s vital to know how it needs to be detailed in the solution. Synthesising requirements from the scenario onto the solution diagrams needs to be automatic and I made the mistake of trying to hold several requirements in my head in order to consider different options. Whilst this may work during a day long workshop it’s no use in a 2 hour preparation stage of the exam. In my situation I didn’t build up the role hierarchy and data model diagram as I went and this resulted in a lack of detail in my own understanding and consequently in the level of detail that I presented. A CTA colleague who is mentoring me uses the term “CIO ready” as the objective for the review board diagrams. The data model and role hierarchy are crucial elements in any solution and I didn’t devote enough time to these diagrams to include all the details needed to help me explain my solution to the judges. In part, the lack of clarity was a consequence of my failure to build up the diagrams as I went (lesson 1). I have two examples from my own feedback which taught me this lesson. Some requirements in the scenario tested that I understood the dependancies between the feature needed for an explicitly stated requirement (e.g., SSO) and supporting requirements which are implicit when using the feature (e.g., user provisioning process). The CTA study guide also sets out the judging criteria relating to SSO requirements as; “…design and justify an end-to-end identity management solution.” a reminder that requirements and solutions don’t exist in isolation from other parts of the scenario. I plan to review the study guide again and check that my breadth of knowledge as well as my plans for diagrams and structure of the presentation to help me hit all of the objectives in each area. I will be going back to the Review Board soon. First I need to be confident that I have strengthened my knowledge areas and practiced some more mock scenarios to test my performance under pressure. The standards of the CTA qualification are high and it really is a breed apart from the other Salesforce certifications. My experience in studying the SalesforceU architect track and sitting the Review Board for the first time is that my knowledge of how to design and describe the architecture of Salesforce based solutions has increased more than I would have thought possible. I have a little more work to do, but I keep in mind the words of a long time CTA colleague; “Stay the course my friend!”. In conversation with Peter Coffee (@petercoffee) at the November 2016 French Touch Dreamin’ conference in Paris. Peter is VP for Strategic Research at Salesforce and his Twitter bio describes him thus; “I work with app developers and CIOs to build a global community of innovation, service and success”. As you will hear, Peter is never stuck for a quote, a metric or a research finding to support his arguments that when building modern software architectures, there is no advantage in duplicating what has been done in times past. What’s available on the Salesforce AppExchange for Lightning Components? Let’s test them out. Tweet your comments and questions to @matmorris. Thanks for watching! 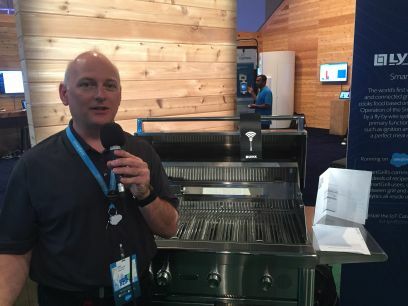 This week we are paying a visit to the Dreamforce IoT Zone. We’ll hear from Doug Merrett and his robot Sparky. Doug is a Principal Enterprise Architect at Salesforce. Sparky is a MeArm pocket sized industrial robot. 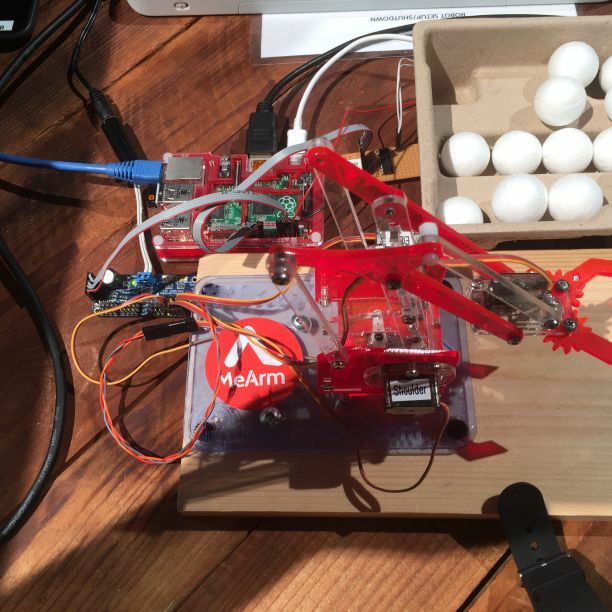 Even though it is 2015 and these techniques have been used for decades to build cars and sort parcels for delivery, not everyone makes the connection that the software which they use on their phone or web browser can affect and interact with the physical world, and for me this is really what the IoT Zone at Dreamforce is all about, helping people imagine what is possible and apply what they have learned to their own situation. All the technology related zones at Dreamforce on the second floor of the Moscone West building were buzzing and they clearly made an impact on Salesforce CEO Marc Benioff as he gave mention in his Q&A session to both Adam Seligman, Senior VP Developer Relations and to Pat.